Published researchers, disability advocates and passionate leaders are all among FIU’s best and brightest. The Division of Academic & Student Affairs celebrated these inspirational students at the 2019 Outstanding Student Life Awards. The annual event honors students from every academic year and college who embody the spirit of FIU. 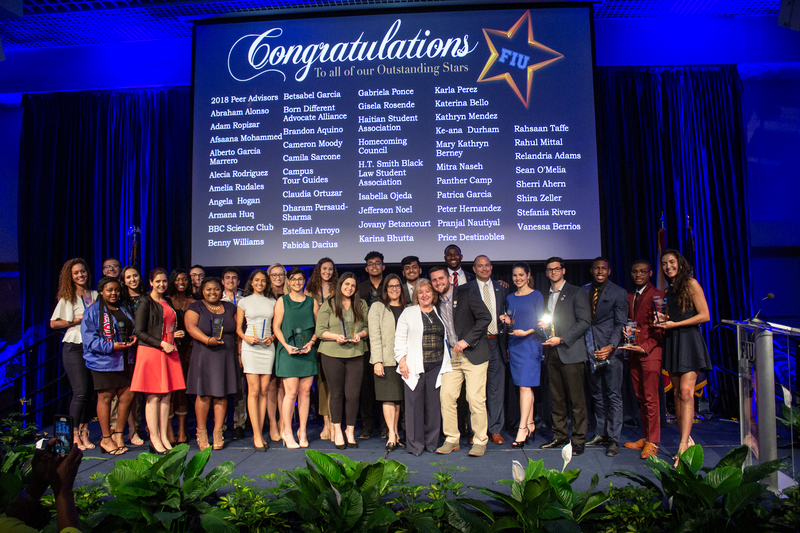 Award winners excelled academically and contributed to FIU as well as local and global communities through extraordinary leadership on campus, exceptional scholarship in their field of study, selfless service, or commitment to diversity. “I am so immensely proud of these students,” said Elizabeth Bejar, senior vice president for Academic & Student Affairs. THE OUTSTANDING SERVICE AWARD recognizes a student’s commitment of time and service to others. Abraham Alonso is committed to impacting his community. Alonso volunteered more than 150 hours as part of the Disaster Action Team and the Home Fire Prevention Campaign for the American Red Cross. He is a fundamental part of the volunteer workforce with a compassionate heart for helping others. As a leader of the Disaster Action Team, Alonso supervises a team that helps those who have lost it all. His team is responsible for installing free smoke alarms for residents in need. In addition, he serves as a mentor to young participants in the program. He hopes to create a Red Cross club at FIU in the future to help students pursue philanthropic work. ORGANIZATION: OUTSTANDING SERVICE AWARD recognizes an organization’s dedication and commitment to serving others. FIU-BBC Science Club was recognized by SGC-BBC Speaker of the House as one of the most active clubs on campus during FIU President’s Town Hall meeting in February. This student organization offered workshops for students in general chemistry laboratories on how to write A+ reports emphasizing on gathering observations, data, and how to analyze results. In addition, club members volunteered to help during the “Sea Rise Solution Day” where students were trained in taking measurements in different locations around South Florida during High tides as part of a large FIU project. FIU-BBC Science Club received “The Outstanding Chapter Award” from the American Chemical Society for our activities during the 2017-2018 academic year. This group was also recognized by the Society as a Green Chemistry Chapter for the number of Green initiatives they hosted this past year. In October, the group presented hands-on activities in the Fort Lauderdale Museum of Science and Discovery under the theme “Chemistry is out of this world,” which explored nebulas, stars, rockets and galaxies. At the event, college students from different universities in the area brought 40-plus volunteers to teach 400 children about science. SHINING STAR AWARD recognizes a student for creating a new campus tradition, implementing an innovative programming idea, or demonstrating exceptional commitment to increase the university’s prestige. Jefferson Noel believes “the most important voice at FIU, is the student’s voice.” Noel has dedicated his efforts to ensure that students’ voices are at the forefront of every media opportunity. At the age of 18, he opened his first storefront business. He has penned numerous online articles and published a book titled “Powerful Presenting: How to Overcome One of the Nation’s Greatest Fears.” In 2016, he founded “Barbershop Speaks,” an organization dedicated to engaging in intelligent discussions at barbershops and beauty salons, to educate, enlighten and empower the community. In addition, he created a national resource known as “L.A.N.E.” – Leaders Accelerating National Excellence, a platform connecting high school students with student leaders from around the country for the purpose of advancing youngsters on their quest to graduate. L.A.N.E. participants include Harvard, Princeton, Purdue, Clemson, and 50-plus universities in the nation. Noel has been featured on WSVN, NPR, WLRN and in print in numerous local newspapers. He is the recipient of the Revolutionary Leadership Award, Outstanding Service Award from FIU, New Generation of Dreamers, and The Young Adult Action Award by HANA, to name a few. He is a distinguished World’s Ahead graduate of FIU, with a bachelor’s degree in Communication and is currently pursuing a master’s degree in Global Strategic Communication. He currently serves as BBC’s President of Student Government Council, is a member of the FIU Foundation Board, and chairs a committee with the Florida Student Association, a governing body of 12 state universities comprised of 400 students. ORGANIZATION: SHINING STAR AWARD recognizes an organization for creating a new campus tradition, implementing an innovative programming idea, or demonstrating exceptional commitment to increase the university’s prestige. Born Different Advocate Alliance (BDAA) is relatively a new organization at FIU that promotes disability awareness on campus and assists students with developing career related skills. This organization addresses current issues, such as the unemployment and high school drop-out rates of disabled students across the United States. BDAA faces these issues head-on and plans events, such as Disability Awareness Week, career development trainings, in addition to teaching the community about the many types of disabilities, while being mindful of their peers. SPIRIT AWARD honors a student that has demonstrated outstanding leadership in promoting campus spirit, pride and loyalty to FIU. Benny Williams has given back to the FIU community in numerous ways and has constantly sought opportunities that give him a platform to positively influence others. As a peer advisor, he shared his pride and spirit with thousands of new students who participated in orientation programs. This exposure ultimately helped him in his campaign for 2018 Homecoming King, where he shared his love of our FIU with our students and the Miami community. Williams traveled with the FIU student delegation to the Bahamas Bowl in his role as Homecoming King. He represented our FIU in multiple parades around town, including the MLK Day and the 3 Kings Day Parades. ORGANIZATION: SPIRIT AWARD honors an organization that has demonstrated outstanding leadership in promoting campus spirit, pride and loyalty to FIU. FIU Campus Tour Guides is comprised of some of the most involved leaders of the university. Every year, they tirelessly offer tours to more than 22,000 prospective students, their families and a variety of guests who visit campus, showcasing why FIU is the place to be. Rain or shine, the members of this organization share a smile and friendly attitude with all FIU guests. They demonstrate Panther Pride and serve as excellent role models for future Panthers to emulate. Their influence is felt each and every day, not only by guests, but also by everyone they encounter via campus involvement opportunities, thereby, exemplifying their dedication and passion to their commendable roles. Their commitment and dedication have made a lasting impact on those who have taken part in their FIU story. DIVERSITY AWARD recognizes a student who embodies FIU’s ongoing commitment to advocate for the importance of appreciating difference, similarities, and uniqueness within the community. Relandria Adams has dedicated her graduate work to support students and staff with marginalized identities, meeting individuals where they are, and offering challenge and support to help students engage in difficult conversations to support themselves and their peers. She has not only educated her staff and fellow graduate students on diversity and inclusive practices, but she has also presented several times at the Student Leadership Summit and other local conferences. Adams is the current vice president of programming for the Student Affairs Graduate Association and is working as a practicum student with Alternative Breaks. Additionally, she works in Housing and Residential Life supervising and managing the student leaders in the department, assisting them in navigating various interconnected identities and providing brave spaces with support for those challenges. ORGANIZATION: DIVERSITY AWARD recognizes an organization that embodies FIU’s ongoing commitment to advocate for the importance of appreciating difference, similarities, and uniqueness within the community. The Haitian Student Association’s mission is to educate, develop future leaders, create opportunities and to develop a network that will aid in paving the way for the community at FIU. Their ultimate purpose is to promote awareness of the Haitian culture and contribute a greater good for the Haitian community. This group has volunteered at Fountain Manor Health and Rehabilitation Center, hosting an inaugural pageant, taught Kompa 101 classes in BBC’s Culture Corner, and partnered with Avanse Ansam, an organization that engages Haitian-American millennials in building economic and political power. UNDERGRADUATE SCHOLAR AWARD recognizes an undergraduate student who has demonstrated outstanding leadership through academic achievement and/or research. Camila Sarcone is completing an independent research project under Alejandro Barbieri, associate professor in the Department of Biological Sciences, and completing her Honors Thesis. She was selected to fill one of two slots in the Provost Research Scholars Program, which is an affiliate position to the MARC U*STAR Program. Sarcone has presented her research 14 times at local and national venues and has earned a poster award at her last national conference. As a MARC U*STAR Affiliate, she was selected to attend the Quantitative Methods Workshop at MIT in January 2018. In addition, she represented FIU at the first annual Florida Undergraduate Research Leadership Summit at the University of Florida this past January. She was also elected president of our U*STAR Club for the 2019 academic year. GRADUATE SCHOLAR AWARD recognizes a graduate student who has demonstrated outstanding leadership through academic achievement and/or academic research. Dharam Persaud-Sharma has engaged in extensive research and received national funding from the National Institute of Health as well as the National Brain Aneurysm Foundation. He has published 19 peer reviewed journal articles, 16 for which he is the first author, and has also authored a book chapter, as well as presented his work in many conferences. OUTSTANDING FRESHMEN LEADERSHIP AWARD recognizes a freshman student who exhibited exemplary qualities of leadership and teamwork, and earned a distinguished record of campus involvement. Rahsaan Taffe became involved at FIU from the start of his college experience. As a freshman, he was elected as vice president of M.A.L.E.S. (Men Achieving Leadership Excellence and Success). Taffe also received the Alpha Phi Alpha Fraternity Incorporated Education Foundation Scholarship as a result of his work within “Knights of Gold Mentoring Program.” He was selected as a 2019 Peer Advisor, and will be spending his summer and fall semester instilling Panther Pride and welcoming thousands of students and their families to FIU. OUTSTANDING SOPHOMORE LEADERSHIP AWARD recognizes sophomores who exhibited exemplary qualities of leadership and teamwork, and earned a distinguished record of campus involvement. Gisela Rosende has taken to heart the idea of paying things forward. As a Panther Camp Facilitator, she was responsible for leading a small group of students at each of the summer camp sessions to connect with each other and learn more about FIU. She later became the executive vice president of Alpha Kappa Psi, a business professional fraternity, participated as a trip leader for Alternative Breaks taking 13 participants to Minneapolis, Minnesota. Rahul Mittal is an active member of the Computer Science Honor Society, Upsilon Pi Epsilon, Women in Computer Science, Engineers without Borders, and has served as the president of the Association for Computing Machinery, as well as, the president of the Academic Success Initiative within the School of Computing and Information Sciences. He has varied interests, deep passion and strong commitments which are exemplified through his commitment as a mentor in the MentorFIU program, president of Your Enlightened Side Plus, an organization promoting health and wellness on campus, and in his role as a resident assistant. Mittal also finds time to be part of the FIU University Choir. OUTSTANDING JUNIOR LEADERSHIP AWARD recognizes juniors who exhibited exemplary qualities of leadership and teamwork, and earned a distinguished record of campus involvement. Adam Ropizar has been involved in many leadership roles both on and off campus including serving as the Lead LGBTQA Student Ambassador, Site Leader for Alternative Breaks, and as a Board Member for the Global Civic Engagement Advisory Board. Ropizar has the ability to apply his passion into advancing the research and needs of the community. When working with LGBTQ initiatives, he represented FIU at the 4Ward Americas LGBTQI Human Rights Symposium and the 31st Annual National LGBTQA Task Force’s Creating Change conference ,where he presented on queer men of color and sexual violence on college campuses. Isabella Ojeda has become an inspirational leader in her organization. As a result of her creativity and ability to connect with her peers, she was chosen to fill a vacant position midway through her first semester. As the president of the Student Programming Council, Ojeda challenged her peers to step outside of their comfort zone and accomplish feats they never thought were possible. She is a strong advocate for collaboration and supporting other organizations and has served on various planning committees such as the bowl game celebration on campus, the Homecoming Uncaging event and Health Living Program’s Zen Fest. Cameron Moody has been heavily involved at FIU since he arrived. After attending Panther Camp as an out-of-state student, he wanted to get involved and make an impact. He went on to serve as a Panther Camp facilitator, the director of sponsorship, and currently serves as the executive director where he oversees the executive board members and all Panther Camp facilitators. In addition to his time spent giving back to support the transition of incoming students, Moody has served the local community and beyond. As a site leader for Alternative Breaks, he raised more than $7,000 for a mission trip to Indiana. His willingness to do what is needed for the betterment of students is both inspiring and selfless. OUTSTANDING SENIOR LEADERSHIP AWARD recognizes seniors who exhibited exemplary qualities of leadership and teamwork, and earned a distinguished record of campus involvement. Angela Constance Hogan embodies global citizenship, strong leadership, and commitment to solve real-world problems, via service and teamwork with tangible contributions, throughout her years at FIU. She quickly joined student organizations related to her field, such as the Water Environment Federation, Engineers Without Borders, and the American Society of Civil Engineers. Hogan became the founding president of the FIU SGA Engineering Campus Council, advocating for fair financial allocation and concerns of more than 5,000 students, including variety of food services. Katerina Bello found their passion for FIU from the moment she walked onto campus. She quickly became involved in leadership positions with Panther Camp and the Greek community. One of her biggest accomplishments was as the 2018 director of operations where she led Panther Camp in fundraising more than $13,000 for the Panther Camp Scholarship Fund. It was Bello’s goal to reach and exceed the team’s goal in order to ensure future incoming students have the means to attend a once-in-a-lifetime opportunity. Although she finds fulfillment within campus involvements, academics has always been her number one priority. As a chemistry major, she wants to prove that women are beyond capable in STEM fields. Shira Zeller is an exceptional student leader that has made significant impact on the FIU community. She’s been involved as a Panther Camp facilitator and executive board member, a peer advisor, student ambassador, peer mentor, Roarthon morale captain, Homecoming Council intern, Admissions tour guide, a member of the Greek community, and a member of the Panther Camp Alumni Council. Zeller is a member of the National Society of Leadership and Success, Omicron Delta Kappa and Golden Key. After graduation, she aspires to find a career within Student Affairs/Higher Education Administration where she can pursue her passion for working with college students. Peter Hernandez is a proven leader, role model and someone who is leaving a legacy at FIU. He’s been actively involved as a member of the Greek community, Panther Camp Facilitator, and Student Nurses Association. Hernandez has participated in several areas within the Student Government Association (SGA), such as nursing senator, chair of the Senate Rules, vice chair of the Senate Internal Affairs Committee, senate speaker pro tempore and currently serves as the vice president of SGA at the Modesto A. Maidique Campus. He is responsible for allocating a $21 million budget toward department and student initiatives, serves as liaison between SGA branches, and most importantly, he is an advocate for all students at FIU. After graduation, he wants to give back to the local community by embarking on a career in nursing. OUTSTANDING GRADUATE STUDENT LEADERSHIP AWARD recognizes graduate students who exhibited exemplary qualities of leadership and teamwork, and earned a distinguished record of campus involvement. Mary Katie Berney has shown outstanding leadership at the law school. Since her first semester, she became engaged with a variety of initiatives, including student competitions, 11 student organizations, on top of doing several internships, research assistant roles, and more recently a clerkship with a federal judge. She has also led the successful publication of four issues of a specialized legal journal and has also led the teams that participated in several international student competitions in Hong Kong and Vienna (Austria). Through her leadership as president of the International Law Students Association, Berney has raised awareness about the importance of international law and has encouraged students to participate in professional development opportunities. Mitra Naseh is a leader, role model, mentor and an advocate for diversity. As a student leader, she has made efforts to enhance the overall graduate students’ experience at FIU. She proposed an increase in the travel fund with the goal to facilitate participation of graduate students at conferences and professional development events. Besides being an outstanding leader, Naseh is a successful Ph.D. student in her field. She has several scholarly publications, multiple national and international level research collaborations and conference presentations and various awards and recognitions. She is currently the speaker pro tempore of the Student Government Association Senate, member of the dean’s Student Advisory Committee, student representative at the Educational Policy Committee at the Robert Stempel College of Public Health & Social Work and member of Omicron Delta Kappa, the national leadership honor society. KAPLAN PRIZE each recipient will receive a $1,500 scholarship toward any one Kaplan Educational Center graduate or professional test preparation course of their choosing. Brandon Aquino intends on thriving so that he may give back to others through a focus on health. Through his involvement as a student ambassador and involvement in student government, he has demonstrated his commitment to service and the university. This Kaplan scholarship will support his goals to pursue a career in the medical field. Ke-ana Nyres Durham has demonstrated resiliency throughout her entire life. She intends to pursue a Master of Science in Social Work degree as well as, obtain a Juris Doctorate. Durham plans to specialize in family, youth and children’s services concentrating on policy practice, which will allow her to work toward improving the government and private systems that serve at-risk children and youth. PRESIDENTIAL AWARD recognizes a student who has significantly impacted the FIU community. Pranjal Nautiyal earned his bachelor’s of Technology in Mechanical Engineering from PDPM Indian Institute of Information Technology, Design & Manufacturing Jabalpur in India and has been working on his doctorate in Materials Science & Engineering at FIU. His research focuses on processing and mechanics of nanotube-reinforced lightweight metallic composites. The goal of his research is to develop strong and light materials, which have promising aerospace and automotive applications. In three-and-a-half years, he has published 14 first-authored journal papers, two more first-authored papers under review, and filed two patents (Aluminum-BNNT composite and Self-Healing Polymer-Graphene Foam Composites). Not to mention, he has given more than 20 oral and poster presentations at national and international conferences as well. In fact, Pranjal’s research on Boron Nitride Nanotube Composite was recognized among Top 15 percent technology submissions to Defense TechConnect Summit and was honored at the conference in Tampa, FL in October 2018. Pranjal’s involvement in materials research and education goes beyond laboratory work and scientific publishing. He assisted writing three research proposals on the “Mechanics of Splat Sliding” to Army Research Lab, which was funded by a $400,000 grant. The Office of Naval Research (ONR) invited them to submit a proposal on Boron Nitride Nanotubereinforced Titanium based composites and then awarded $450,000 grant based on it. And just a couple of weeks ago, Army Research Office awarded $400,000 grant on “Ultrasonic Cavitation of Aluminum- Boron Nitride Nanotube Composite.” Thus, Pranjal’s research and writing have already resulted in $1.25M in research funding from federal agencies. In addition to his exceptional contributions to research in Materials Science & Engineering, Pranjal has been a leader on campus, serving in leadership roles on the Material Advantage FIU Chapter, Council of Student Organizations, and the Student Advisory Board for Advanced Materials Engineering Research Institute. He has also served as a reviewer for several international journals. Pranjal has consistently exhibited his excellence at national and international levels in publishing, presentations, technology development, grant writing, collaboration and above all being a great human being. He has excellent demeanor and is always willing to help others. He is a true leader and rarely found all-rounder at such an early age in the academic world. Congratulations to all the 2019 Outstanding Student Life Award recipients and finalists!